WASHINGTON — Decisions are looming on two major new US Navy shipbuilding programs, and while the service wants to get the best deal for the ships, it's also concerned about preserving its industrial base. To that end, acquisition chief Sean Stackley is structuring the competition to build the new T-AO(X) fleet oiler and LHA 8 amphibious assault ship so that San Diego-based General Dynamics National Steel and Shipbuilding Co. (NASSCO) and the Huntington Ingalls Industries' yard in Mississippi — each of which plan to bid for the ships — both get enough work to remain viable. The ships "are key to our core structure. And they're also key to our industrial base," Stackley said March 18 in an interview. "So when we try to balance requirements and affordability in the industrial base, a couple of things come to mind. First and foremost is, we have two major builders for these types of ships, Ingalls and NASSCO. And each of them are in a position where they have to win one of the programs. However, if we go down the path of competing them one at a time, it's easy to envision a scenario where either one of them sweeps the table." A decision on the T-AO(X) is expected in 2016, with the LHA 8 to come in 2017. Stackley noted that the yard that does not win the oiler "will be in a very difficult position to compete head-to-head for the next program, the LHA 8, because of the imbalance of workload that was just created between the two. So to keep them head-to-head in terms of competiveness, we have determined that first, we're going to limit the competition to those two shipyards, because each needs to win one of those first two contracts" to remain viable. In return for limiting the competition to Ingalls and NASSCO, Stackley said, "we are going to require that they both bid on both programs, with a commitment that each of them will win one of the contracts, as long as their bids are responsible." That approach, he said, "gives us the stability we're looking for in the industrial base. It gives us the advantages of competition across the programs." 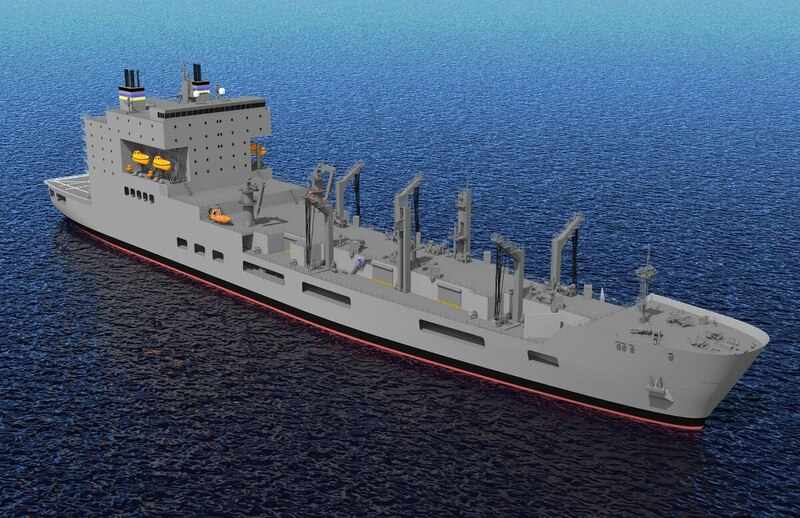 While NASSCO has extensive experience building support ships for the Navy and commercial tankers and container ships, it has not built a large, sophisticated assault ship of the LHA type. All of those ships, however, have been built at Ingalls, which in turn hasn't recently built any support ships. Many of the fleet's current oilers, however, were built at Ingalls' sister shipyard Avondale, now closed. 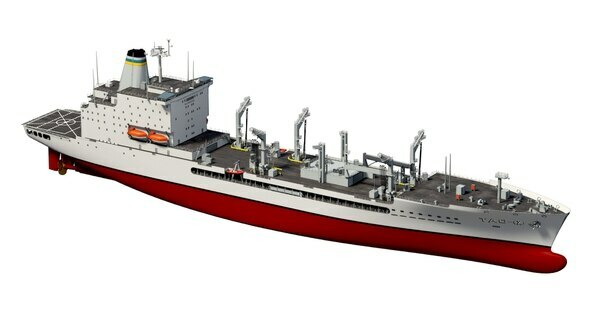 T-AO(X) Fleet Oiler concept from Ingalls Shipbuilding. To many observers, it appears as if the Navy's bidding strategy concedes that Ingalls will win the assault ship and NASSCO the oiler. "No. There's no predetermination whatsoever here," Stackley insisted. "We've determined that both shipyards are capable of building both ship classes — and we spent a lot of time doing that evaluation before we went forward with this acquisition strategy. We've also sized, as best as we reasonably can, the awards so they're about equal in terms of the amount of work going into the winner of each of these — six T-AO(X)s on one hand and LHA 8 on the other. We think that, in terms of the shipyards' capabilities and in terms of the size and shape of the workload, we've got parity here for a very healthy competition." The Navy's decided this month to delay delivery of the new DDG 1000 destroyer Zumwalt from August to November. The roughly $4 billion ship, under development for more than a decade, is being built at General Dynamics Bath Iron Works in Bath, Maine, and is scheduled to begin sea trials late this summer. The new delays, the Navy and Bath said, are due to intricate testing procedures for Zumwalt and its highly complex systems. "DDG 1000 is about 94 percent complete," Stackley said, "and it has come together very well in terms of a lead ship, particularly given the uniqueness and complexity of this destroyer." The design, with a 78 megawatt integrated power system, has "a very high demand for electrical work, and that is the pacing activity today in terms of completing those systems and doing test and activation." Pushing back the delivery date, he said, allows more time to get the work done. Three extra months, he said, "is our best estimate today. If we are wrong in that estimate, we are not wrong by much." Asked if the delay would add to the ship's cost, Stackley said the approach is for "optimal scheduling. We've been very clear we would rather provide schedule relief than try to throw money after schedule. Working with the shipyards, we've agreed to provide some relief to the schedule to mitigate any cost impact associated with this system completion and activation." Stackley acknowledged that Bath has had issues restarting production on DDG 51 Arleigh Burke-class destroyers. The Navy had planned to end DDG 51 procurement with DDG 112, the 62nd ship, but in 2008 decided to truncate Zumwalt-class production at three ships and return to Burke-class construction. Bath already has been awarded contracts to build DDGs 115 and 116, but the company has had issues getting the right sets of workers in place to build the DDG 51s while continuing to build Zumwalts. The Burke destroyers involve "a different skill mix" than the Zumwalts, Stackley said. "So while we have to be mindful that one program doesn't impact the other in terms of schedule, what we see today are separate, distinct activities on the respective ship programs. And we're trying to preserve the schedules — unless those schedules start to come in conflict with our need to control costs on both programs." Progress is continuing, Stackley said, on development of the air missile defense radar (AMDR), a Raytheon sensor that will replace Lockheed Martin SPY-1 Aegis radars on DDG 51s beginning with the DDG 124 — a modification known as Flight III. Bath and Ingalls each compete to build DDG 51-class destroyers, and it's still not clear which yard will build the first AMDR ship, part of the 2016 budget request. "A critical design review was competed in December very successfully," he said of the AMDR. "We're pressing forward with completing the component development, and we're basically getting the detailed information required from the radar itself to provide to the shipbuilders to incorporate in their detailed design for the FY16 ship. That upgrade will be competed between the two builders. So today, it's premature to talk about who would build the first Flight III ship. It could be Bath, it could be Ingalls." An issue being worked out between Bath and Ingalls is how to satisfy a swap agreement signed in 2002 when the Navy reassigned all construction of LPD 17-class amphibious ships to Ingalls. The agreement stipulated that should the Navy build a 12th LPD 17 at Ingalls, an extra destroyer or equivalent workload would be given to Bath. At the time, Stackley noted, the Navy had no plans to continue DDG 51-class production beyond DDG 112, and was planning to build only 10 LPDs. "Nobody would have contemplated that subsequent to that swap agreement we would have restarted the DDG 51 line," Stackley observed. "And in fact, that there would be a later swap agreement across the DDG 1000 and DDG 51 programs involving those same two shipbuilders. … Here we are effectively 14 years later when an LPD 28 would be awarded." No decisions have been made, Stackley said. "We are reviewing that swap agreement to determine how best to meet the conditions we laid out," he said. "Discussions today are preliminary, because we're on the front end of discussions with the respective companies to resolve whatever remains to be resolved."